I've just bought myself the leather boots from H&M (2) because I was longing and lusting for some really nice Ankle Boots this season. Rich, dark, made out of leather, not too high, an everyday shoe, something simple yet special, these were my criteria for the perfect Boot. Yeah, I was actually looking for my Chelsea Boots with heels. 1-Leather Ankle Boots from Zara. 2-Leather Ankle Boots from H&M. 3-Leather Ankle Boots from &Other Stories. 4-Chelsea Boots with Heels from Asos. 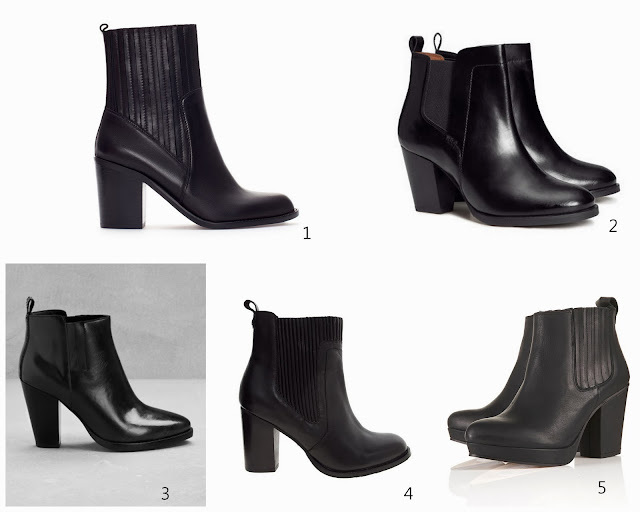 5-Chelsea Boots with Plateu from Topshop.